For three years, Facebook has failed to provide Apple Watch access to WhatsApp that goes beyond replying to notifications. There just had to be done something about it. As of right now, WhatsApp notifications do not allow you to open chats. 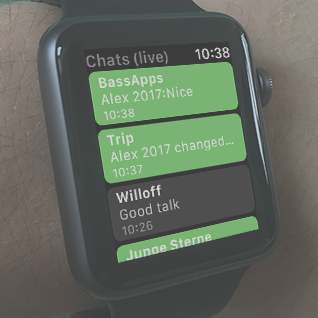 Unlike the original notifications, WatchChat lets you play Whatsapp voice notes right from your Watch. WatchChat enables you to dictate and scribble messages to any conversation - no more waiting for notification popups! Interested? Download on the App Store and Play Store. WatchChat has been released 10/27/2017.